Greenleas School in Kestrel Way, Leighton Buzzard is a thriving primary school in the middle of a still expanding residential development. Following a process that involved building design, planning liaison and construction management, we are delighted to announce that a new free-standing nursery building has just been completed on the school site. The official opening ceremony took place on Friday 16th January, and the ribbon was cut by local MP Andrew Selous together with help from some of the teachers and pre-school children. PCMS designed the new single storey building, specified the materials to be used and project managed the build. The building comprises a large play room with separate office, kitchen and WCs. PCMS also designed a canopy across the back of the building, which provides sheltered outdoor play space. This is the latest in a series of projects that we have completed for Greenleas School, both at Kestrel Way and at the school’s other site in Derwent Road. 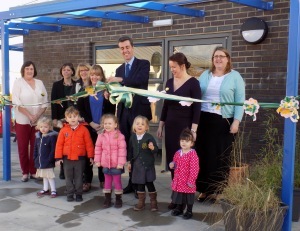 Both teachers and children are very pleased with their new home: “It’s great to have a new building which has been specifically designed with small children in mind; it incorporates safety features and is a wonderfully light and airy space to work and play in” said Headteacher Rebecca Clarke. This entry was posted in Bedfordshire, construction, design, Early Year's, Pre-School, project management on January 29, 2015 by admin.